Here we demonstrate how to send Ethernet traffic directly from an FPGA to a PC. An FPGA development board, with 2 free IOs and a 20MHz clock. A PC with an Ethernet card, and the TCP-IP stack installed (if you can browse the Internet, you're good). Optionally, a network hub or switch. 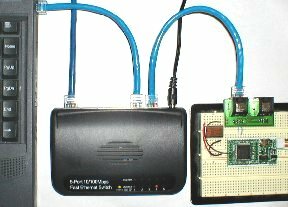 Here's a view of a typical test setup, using an Ethernet hub or switch. Using a hub or switch allows the PC to stay connected to your regular network (if you have one) while doing this experiment. But you can also connect the FPGA directly to the PC. We are using a Pluto board here with an external 20MHz oscillator. Connect two IOs from the FPGA board to an Ethernet cable. 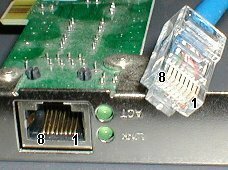 If the cable's other end connects to a hub or switch (like on the picture above), use pin 1 and 2 of the Ethernet cable. If the cable's other end connects directly to the PC, use pin 3 and 6. Note that the polarity usually doesn't matter, because the signal is differential and Ethernet equipment can detect the polarity from the incoming signal. Also even if that works in practice, we are not compliant to the Ethernet electrical requirements by just connecting the FPGA to a cable (we would need a filter and a transformer). So let's just consider that a "lab" experiment. Type "ipconfig /all" on the command-line. Write down your "Physical Address" and your "IP Address". Compile the following Verilog HDL code. Update the data values ("IP source", "IP destination" and "Physical Address") in the code. Do the correct pin assignment for your board (there are just 3 pins used!). About the "IP source" that you have to choose in the code above, pick something that is compatible with your network, but still unused. The example network shown above have IPs starting with "192.168.0" (the PC IP is 192.168.0.2 with a mask of 255.255.255.0). So here IPs like 192.168.0.x can be used. To check if an IP is used or not, "ping" it. Run this UDP receiver software on the PC (source code included). The code above sends 18 data bytes in each UDP packets. The 18 bytes can come from anywhere, so for example, you can modify the code to send the value of FPGA pins. Have fun sending UDP packets!